The decision of the Reserve Bank of India to reduce the repo rate by 25 basis points is likely to benefit you if you have been paying EMI of your home loan or vehicle loan or are planning to go for a home loan or car loan in the near future. 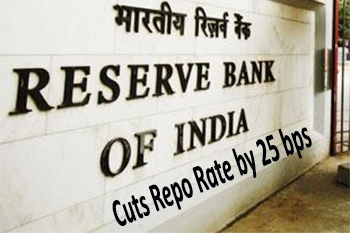 The decision of the Reserve Bank of India to reduce the repo rate by 25 basis points is likely to benefit you if you have been paying EMI of your home loan or vehicle loan or are planning to go for a home loan or car loan in the near future. This is because the banks and financial institutions are likely to pass on the benefit of lower interest rate to their customers which, in turn, would bring reduce the EMIs of big ticket loans such as home loans and vehicle loans. Currently, the interest rates on home loans vary in the range of 8.5% to 9.5%, depending on the tenure and amount of loan.Similarly,the interest rates on car loans vary in the range of 9% to 10%, depending on the amount of loan. The banks are expected to reduce the interest rates on both home loans and car loans by 25 basis points. Hence, the interest rate on home loans could come down to 8.25% where it was 8.5% previously and the interest rate on car loan could be reduced to 8.75% where it was 9% earlier. However, if a borrower has borrowed under the MCLR (marginal cost of fund based lending rate) based rate, he/she may have to wait until the next reset date to avail the new rate. If the reset date is far off or if the interest rate differential between the existing lender and new lender is one per cent or more, such borrowers have the option to shift their loans to other lender offering loan at a cheaper rate. The base rate borrowers can switch over to the MCLR rate regime to take advantage of lower interest rate.